When people ask about singing I always give the same answer. All range, no skill. That’s me, though it’s probably a little unfair to the parents who paid for lessons, and the singing teachers who taught me for years. It feels accurate though, because despite many years of pretending otherwise, I really can’t read music at all, I struggle with pitching, and I can’t ever hear my line in a harmony. I can sing a bunch of notes though, so I do. And as with a great many things in life, I do so with great (and slightly intense, I imagine) enthusiasm. If being enthusiastic is a talent, then that’s my talent. Need someone to think your thing is the best thing ever. Give this girl a call [points at self]. In recent times I have been testing the limits of my singing a bit – dabbling in interesting bass lines, mostly hanging around the tenor section (being a tenorlady, yes the joke is purposeful, no I will not stop making it) and singing soprano while dancing (!). Sometimes singing soprano instead of tenor for kicks/to see if I can still hit the high notes – with questionable results. I remain, I fear, mostly range, minimally skill. But, the other people in the room are full of skill, and range, and all that good stuff. So, you should come and see them. And me. But them. And their wonderful skill, and beautiful singing. I have spent this evening repeatedly telling people that I’ve not auditioned for 9 or 10 years, and in the interests of honesty I should say I’ve realised that’s a lie. Technically I auditioned about 4 years ago for a music theatre showcase. I sang ‘A Spoonful of Sugar’ because I’m everyone’s mum and I’ve got a posh girl singing voice. I didn’t get in, which was a blessing because on the evening of the actual showcase I had no voice and only just made it through the evening. I also auditioned 8.5 years ago, when I first started university, to be in Grease. I was also unsuccessful there, but it did help me find my place backstage, so I mustn’t complain. Regardless, this evening when I auditioned for the first time in a fair old while (if not actually 10 years) I remembered what it feels like to be genuinely, face-shaking, knee-knocking nervous. As a general rule, I’m a fairly nervous person. I just hide it well with facts, and lots of confidence in other people. Once I know people I also hide my nerves with wild gesticulations and slightly ridiculous voices. I’m just used to having low-level nervousness most of the time. In a slightly unexpected turn of events, most of my nerves came through in my singing (I think), and I managed almost all, if not all, of the basic dance. A definite first for me. 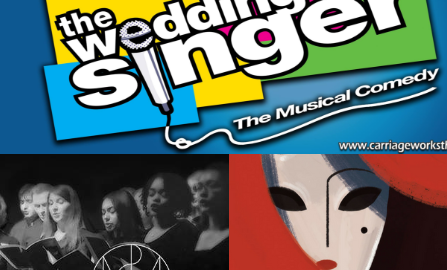 One way or another, I’m looking forward to the Wedding Singer – it seems like a fab show, and if I don’t get to see it from onstage then I’m sure I can see it from the wings or the audience. And one way or another, I’m proud of sticking with today, pushing past (to a certain extent) the nerves, and getting involved. When the worst outcome possible is someone saying no, that’s not a terrible thing at all. Let me tell you about two moments in my life, both related to the 21st-23rd of February 2007. My upper school did a production of Bugsy Malone. I was 16, nerdy, and had just chopped all my hair off in some kind of show of teen individualism. I knew I wouldn’t be cast as Blousey Brown (the lead) and I didn’t want to be. Ever since playing the little match-girl in year 6 I’ve been successfully blending into the background of shows. I just wanted to be involved. Then the cast came back, and I’d been given a one-line part, as the failed opera singer who auditions to sing at the club. My heart sank, and I went to find Mr Jones to tell him that I couldn’t do the part. I was so self-conscious of my voice already, and I felt like taking the part would be the final nail in my already quite firmly sealed social coffin. He was nice about it, and said that I should do it – it’s the right style of voice for me – but he let me drop it on the promise I’d still be involved. And I was. In that show, I ended up doing everything, from building set, stage managing, costume, to playing about 6 different parts and helping choreograph some of the dances. It was one of the shows which definitively gave me a love of every side of theatre. Moment two came a few weeks after the show. We were packing down after a live rock concert which Mr Jones organised every year. He was a “cool” teacher, not really much older than us, and with a background in media which meant that traditional dirge-like music teaching really wasn’t for him. The DVD for Bugsy Malone had just been sent through, and as we packed down the amps and staging for the concert, he mentioned he’d watched it. I found out yesterday that Mr Mark Jones was fatally injured in a car accident last Friday. Since I heard, I have seen so many other people sharing their moments, and that’s what he gave people. Until the second moment, I’d thought he didn’t like me, with my classical voice and my complete inability to learn the flute. But in a few words he proved otherwise. When I got to Uni, I met OperaSoc, and suddenly found the people I’d been looking for. I could do all of the theatre things I wanted, without feeling like I’d lose friends in the process by being “uncool”. I don’t think I’d have joined if I didn’t have Mr Jones’ voice in the back of my head reminding me that I’m an opera voice. He also, incidentally, introduced me to ‘Into the Woods’. It’s my favourite musical, and one of the productions I am most proud of my work on. The quote about moments which I began with is from the show. Now I’m a trustee of Northern Opera Group, and I work in the building where I took part in my first OperaSoc show, and where I gave countless hours to improve on the backstage skills which Mr Jones began teaching me. It is not overstating to say that everything I am today, I am because of those two moments. I’m desperately sad that Mr Jones can’t give other people their moments any longer, but I have 100% confidence that in the almost 11 years since my moments, he’s done the same for hundreds and thousands of other people. He’ll be in my heart and memories forever. Last night the sky was so perfectly clear that I stood outside for 15 minutes before I got home, and just stared at the stars. The thing about stars is that they mean everything. They have been interpreted in literally every way possible, from controlling and dictating our personalities, to creating everything in the universe. They can make you feel tinysmall, like nothing you ever do will matter in the vastness of the cosmos. Or they can make you feel huge, because out of all of the particles in the vastness of the cosmos, a few billion decided to come together and form you. I’ve spent all afternoon singing, and I’ve no idea where the song choice came from. I do love a good sing though, so I thought today’s update could be the songs I most like to sing. *Disclaimer. These are not songs I sing for other people. I will not sing for you. I am not a good singer. Yes, I know I did opera. Still not a singer, still not singing for you. Fly me to the Moon – Frank Sinatra. Who doesn’t love singing swing? Transatlanticism – Death Cab for Cutie. To be honest, this is just a lovely tune. I love this version, and I definitely always try to sing all the parts. Also All Angels were just great and I definitely wanted to be them. Chained to the Rhythm – Katy Perry. Because how can you not really? Or really anything from my mum’s 60s album. But mostly this. The most fun piece of bank advert music ever. I can’t help my age, ok.
One of these at least was going to be a musical, and if we’re talking about a slow build and fantastic finale (which we are, obviously) then nothing comes close to this. Boyfriend and I had a discussion about this the other day, essentially along the following lines. What is the difference between a geek and a nerd, and are we one or the other or both? There is a difference between geeks and nerds. Nerds are smart, people who lack much of a social life. They often have very few friends. Nerds don’t talk much, and don’t expect others to talk much to them. They are usually nice people, but don’t have the social skills to go out and meet new friends. My definition is more that nerds are analogue, and geeks are digital. But I’ll take both. Today, I met up with a friend from many many years ago (pre-blog era, so I mean, AGES AGO) and decided that I am well and truly both a geek and a nerd. Evidence for this. My friend is internet famous and I think that’s really cool. Apparently, I’m the only person who has said this to him, though I’m presuming he means in real life and out-loud (because the whole point of being internet famous is really not to be real life). I think it’s cool, because I’m a geek, by my own definition. I love digital, and people who digital well, and understand technology and make it do cool things. The furthest I might go is a blog, but guys, at least that’s something. I also like games, which seems to lead to automatic geek status (unless those games are football games, which don’t count). Here’s where my nerd thing comes in. My interests are very diverse, and I can practically see Boyfriend’s brain switching off once the topic moves away from geekery and into nerdery. And because I’m a bit of a nerd, I don’t talk to as many people because of my lacking social skills (see internet definition above). I’m nerdy about all kinds of things. I’m a language nerd, a governance nerd, a theatre nerd, a fantasy nerd. In terms of fulfilling the stereotype, I’m there, with bells on. I’m also initially shy on any of those topics, until it becomes clear that I should share absolutely everything I know about Celtic mythology, or whatever the topic is. Once that happens, I imagine I light up like some kind of insane ball of energy, and unleash fact after fact until someone calms me down or I tire myself out. Being a nerd is a definite lifestyle choice. All of my conversations with my friend today were geeky or nerdy, and it was pretty wonderful to remember there are people out there who are as far down those roads (maybe) as I am. We ended the day sitting in a park, and it was really as if the 9 years since we last really saw each other just hadn’t happened. Here’s to more geekery and nerdery and friends. *Side note: When did Urban Dictionary stop being full of offensive definitions of my name and become all about actually useful definitions? I don’t like this new modern world. **Second side note, not referenced at all in the text above (I’m bad at this). I’ve spent all day with this in my head, which I think was popular when me and my friend were friends previously (shut up, I know what I’m saying).